Jill DeWit: Dot, dot, dot. Jack Butala: So much better than, I think, any other investment vehicle. Jill DeWit: Well, you know, I was looking at the reverse. I was looking at this way, too. What is better than real estate? If you look at it like that, it’s pretty hard to come up with anything. Jack Butala: I have a lot to say about this in the meat of the show. Jill DeWit: Okay. I gotcha. Jack Butala: Before we get into the meat of the show, let’s take a question posted by one of our members on the JackJill.com online community. It’s free. Jill DeWit: Okay, Luke says, “I started selling land at about six a.m. today and stayed on the phones until 2:30 to go get the kids. I tallied up the sales, and sold just over $45,000.00 in land from $500.00 to $5,000.00 properties. No big money deals, just bread and butter. Solid sales all day. It’s fun. One lady was screaming, happy to buy some land in Northern Arizona. She called to ask me some questions. There were police …” Oh. Jack Butala: This going so good. Jack Butala: I love that. You can’t make this stuff up. Jack Butala: We’re having that exact same experience, Luke. Exactly. Jack Butala: Luke, I’m so happy and proud of you on your success. Luke was one of our original members. This is Luke Smith, and I’m going to plug his YouTube channel, because it’s truly amazing. He’s sky rocketed way surpass us, which makes me a little jealous, but it’s good. Jack Butala: But you’re actually also interested. His channel is really helpful. Jill DeWit: I know. Luke is great. Luke is one of our members. Luke learned from us, and it’s his way of paraphrasing and describing what we do. So, it’s the same thing. I mean, Luke’s just relaying what we do in his words. Jack Butala: Yeah, it’s his quest. Yeah. Jill DeWit: So, it’s really good. So, yeah. Love it. 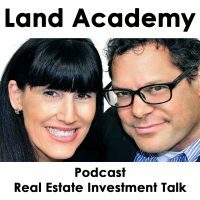 Jack Butala: Today’s topic: Real Estate is Better Than … lots of stuff. This is the meat of the show. Jack Butala: Owning a manufacturing facility. Jack Butala: You got a dump truck? Jack Butala: What did you say? Jack Butala: There’s a lot of things you can do for a living. You could be a teacher. You could buy a manufacturing facility. You could own a car dealership. There’s a lot of things. You could go to school and become an engineer. Jill DeWit: You could be a truck driver. Jack Butala: A lot of stuff. Jill DeWit: You could be all kinds of things. Jack Butala: You could be an airline pilot. But, here’s at how I look at it. If you take a bunch of steps back, if money is your goal and equity, personal wealth and worth is a goal, you can’t beat real estate, in this country anyway. Here’s why. Old school business ownership requires a tremendous amount of investment capital. You’ve got to buy a plant, you’ve got to buy a building. You’ve got to rent a building. You need inventory. You need the education to learn to know how to do all this, so it used to be you had to go to Business School on and on and on. All that adds up to, in accounting speak, fixed costs … before you ever sell a darned thing, you’re accumulating costs and risk. 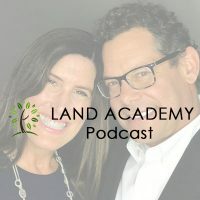 With real estate, what you learn … that’s what this podcast is for, you go out and buy some land for cash, and now you own a piece of land for cash. Hopefully, you bought it right. And, you resell it. It doesn’t cost you anything, except your time. You’re learning anyway. So, just from a flipping perspective, I can’t think of anything better to flip, than real estate. If you flip a car, the second you own it, it’s going down in value most of the time. Jill DeWit: Also, let’s think … there’s just so many practical things, too. I think about where are we going to store all this inventory? Jack Butala: All of it. I mean, this could be a five hour show. Jill DeWit: I love watching Shark Tank. That’s one of our favorite shows, is Shark Tank. It’s interesting talking to people in all the manufacturing. All the stuff they have to deal with, like manufacturing and trying to get their costs down, and then storing the inventory, and the packaging … I mean, there’s so much physical stuff that goes into it. I’m like, oh, it just makes my head hurt. Even those guys that are doing it well, I’m like, I don’t want any part of that. It’s entertaining. That’s really entertaining to me. I will never do anything like that. Jack Butala: One of the greatest values of Shark Tank is to watch it and just … like any reality show, it’s like … well, it’s really good that that person’s life is worse than mine. I think I’m going to watch the next episode, and make me feel even better about myself. Jill DeWit: Right. That’s so interesting. Jack Butala: Nowhere else, that I know of, can you more effectively build a balance sheet and an income statement, which means counter speak for equity, accumulating equity and money come in through the door every day. When you buy a house … let’s theoretically say if you buy a house for $30,000.00-$40,000.00 in Michigan … this my sister’s model. My little sister, she buys a house for $30,000.00-$40,000.00, gets a tenant in there for $900.00, she owns the house, the house is going up in value 10 or 12% a year, and she’s collecting $900.00 a month. So, she’s got the balance sheet piece. The thing’s going up 10 or 12% a year, and she’s got the income statement piece to pay for any repairs or maintenance on the plant. So, I defy anyone to tell me what rapidly grows like that for a regular person. There are people like the Coke brothers, they would disagree. And, they’re actually right. But, we’re not the Coke brothers. Jill DeWit: Wait, the movie guys? Jack Butala: The Coke brothers? The oil refinery people. Jill DeWit: Oh, sorry. Who are the movie brothers? Jack Butala: I’d love to just get inside of Jill’s head. Jack Butala: I want to be in Jill’s head for like 20 minutes. Jill DeWit: Jack! Who are the brothers that we talk about? That you love. Jack Butala: They’re in trouble right now. Jill DeWit: No, what is their name? Jill DeWit: No, not them. Jill DeWit: No. There’s two brothers. I thought it starts with a C. Shucks, I can’t think of their names. Jack Butala: Oh, the Cohen brothers. Jack Butala: Oh, the Cohen brothers, Coke brothers. I don’t know. One of those brothers. Jill DeWit: That’s a really weird … why are we going to use those guys? They always double their money on a movie? I don’t think so. But, okay. Jack Butala: By the way, they’re just writers. Jill DeWit: I know. That’s why I thought that was a really weird reference. Jack Butala: If you pretend this happens, like something like this happens with you, Jill, it makes me have more love for you. I’m serious. It’s the cutest freaking thing there ever was. Oh, Coke brothers, Cohen brothers. I don’t know. Whatever you think. Finish your sandwich. Jill DeWit: All right, here’s my question on this topic. We all get real estate is better than these thousands and thousands of things. Well, let’s look at the reverse. What could you say X is better than real estate? This is where I was trying to think of this, and I’m like … I’m having a real hard time coming up with anything, seriously. Can you think of anything? Jack Butala: No. That’s why I’m in this business. Jill DeWit: They make a lot of money. Jack Butala: I’m ashamed. As a business model, but it doesn’t have the balance sheet piece. It would make a ton of money. If you write a book one time and sell it a million times, you’re going to make some dough. That’s what the Shark Tank people call “scalability.” Software is like that, too. And, then you hope you sell the company. But, if you’re writing the book, or writing the software, there’s not a lot left to sell except your talent. So, the income statement piece of this is fantastic, but the balance sheet, there’s just nothing there. Jack Butala: We all know people have … Jill has some distant relatives who own a very successful commercial printing company. There’s a lot to sell at the end of that. That fulfills the balance sheet and the income statement perspective. But, I’m talking about for regular people. Not everybody can buy and run a print shop, a large print company commercially, and make, grow and do all the right stuff. For a regular person, there’s nothing better than buying a piece of real estate and re-selling it, especially if you buy it right. Jill DeWit: You know what? Here’s the reality, too. I think we all know this. I’d like to think is a no-brainer. Look at all the people that have made so much money in other areas. What’s the first thing they do? Go plop it on real estate. What does that tell ya? Jill DeWit: Isn’t that … you know? Jack Butala: There’s all kinds of cute little sayings that people use like, “More millionaires have been made by real estate than any other … ” you know. We could sit here and say all that. Those are probably all true, or some version of them. That’s not what I mean. Here’s a perfect example. Are more employees or less employees better? Jack Butala: Less. Are more customers that you hear from forever, that come back 10 years after you sold them something, better or worse? It’s worse. So, in a perfect world, like in a vacuum, you would have no employees and no customers. Jill DeWit: What about your family? Where does that fit in? Do they make the cut? Jack Butala: Why does this come back to family? Jill DeWit: You’re painting a pretty bleak picture here. Jack Butala: It’s a beautiful picture. Jill DeWit: In a perfect world. Jill DeWit: You’re alone, and you’re wealthy. Jack Butala: Yeah, what’s wrong with that? Jill DeWit: Like, gee … you’re going no employees, no office, let’s take the wife out too … just kidding. Jill DeWit: It does. I’m very happy with that. Jack Butala: Does that involve your family. What goes on in your head, Jill. Jill DeWit: Okay, nevermind. Your kind of like … all right. I know you’re right. Sometimes it’s hard to hear. Jack Butala: Here’s a story. You have ten grand, you send a bunch of mail out, you buy a piece of property for five or 10 grand. This is you now. With Jill’s family thing, I don’t know what that’s all about. You don’t have any employees, you make all the decisions yourself, you still have a job, which you should, and you sell a property for $25,000.00. The person that buys it from you says, “You know what?” Just like Luke said here, “Thank you. You solved a huge problem for me.” And you never hear from that customer again, so now you don’t have any employees, and now you’ve just moved on to the next deal, and the next deal. You could build an empire. I’m here to tell you. The name of the show is: Real Estate is Better Than … I can’t think of anything. Jill DeWit: Yeah. I have question. Jill DeWit: What brought you here? We’ve talked about this off the air, and I wanted to talk about it again. What was … I think it was funny. I think we talked about me, we didn’t really talk about you is why I’m thinking of this. What brought you to real estate? Jack Butala: Nothing’s new there. Jack Butala: All of our listeners know all about you, Jill. Jill DeWit: Funny. Well, I’m going to change this now, mister. So, what brought you here? Why, as a child, did you know … at one point in your life did you know, “Oh my gosh, there’s money in real estate,” and then set out to make this your goal? Jack Butala: So, a few things happened. Number one was, real estate was just part of our lives when we were young. My parents were into it. My parents bought a house before I was born for $13,000.00, and about the time I was in sixth or seventh grade, sold it for, I think, $87,000.00 or $89,000.00. We moved into a really, really nice house in a neighborhood. We’ve moved from a pretty mediocre-awful neighborhood, to THE neighborhood in Michigan, southeastern Michigan. At that age, you’re really impressionable. I remember sitting there thinking, what if I did this 40 times? How can I speed the process up? Jill DeWit: At that age, you thought about that? Jack Butala: Yeah. How can I make that … if that’s the case, they’re enjoying it and they’re like, “This is great.” They had regular jobs and careers and stuff, but I’m sitting there going, why not … as a kid, you have to see stuff. You can’t just think about it. So, I’m like what if I just bought every single house on the block and did this? Well, I would have to wait 10 or 15 years. How can I speed that up? I just solved one problem after another. Ultimately, it became … if you offer everybody half of what the thing’s worth, how it evolved … does that answer your question? Jack Butala: I have a lot more to say about it, but I don’t want to bore you. Jill DeWit: No, where I was digging at was the family part, and you watched it. You were already doing the math. You were in middle school doing the math. Jill DeWit: Yeah, I remember thinking … because my dad was friends. I remember thinking this guy has got a helicopter. I just remember helicopter. Real estate equals helicopter. That’s cool. All right. So, there’s obviously money there. That’s what I remember. I also, like you, I just liked it. I remember learning about zoning. I worked for these developers, and it was actually fun. It was like a puzzle for me [crosstalk 00:15:26]. Jack Butala: See, now it’s about you again. Jack Butala: It should be about you. It’s the Jill show … with Jack. Jill DeWit: Just kidding. All right, so back to the Michigan … okay, all right. Jack Butala: That’s it. That’s the answer. Jill DeWit: Oh. That was it? Jack Butala: I can go for five hours on why I think this is the best investment vehicle there ever was. Jill DeWit: Wait, but you didn’t go to college? In college, you kind of changed gears. Well, didn’t change gears, but you were going a different path. Were you always trying to end up back here? Jack Butala: Yes. Honestly, back then, you couldn’t get a degree in real estate. I honestly think you can get a master’s degree in real estate now. Can you? Jill DeWit: Don’t get me started on that one, please. Don’t go there. Jack Butala: I don’t know if you can or can. You probably can. I heard you could get a degree in anything. Jill DeWit: I heard you can. I’ve heard you can. Jack Butala: What’s so funny? Do you have personal experience with this? Jill DeWit: Yes, I do, and I’m not going to go there because I’m going to dig a big hole. It’s all good. Jack Butala: Okay. Accounting … all the most successful people around me when I was that age had degrees in accounting. They worked for … back then it was one of the big six accounting firms, for a few years. Cut their teeth, and then went to work for one of their clients, the big six clients, because they got job offers. So, I followed in that path almost to a T, and it worked out good. Eventually, I did what I wanted. I invested in what I believe in, if you can’t tell. There’s no faking it here. I believe in this … if you believe in something, it all starts with that. If you have a working example of something that you believe in, and you’re going to replicate it and put your own twist on it … just like Luke Smith did us with our stuff, you’re going to take the thing to the mind. Jill DeWit: And you’ve tested it? Jack Butala: Why not do it with something that you just know is good? For me, it never made sense to take a risk as a shop owner. You see a lot of examples of really successful restaurants, but there’s no way I want to take that challenge on. What do you have that’s successful anyway? An income statement and a balance sheet? No, you’ve got a hell of a lot of employees, you probably have a bunch of debt, you’ve got screaming people in the kitchen. Jill DeWit: I don’t want to deal with all that. Inventory. We have inventory, but it’s not the same. Ours doesn’t spoil. It’s a whole different thing. Jack Butala: So, you know, that’s where I am on that. Jill DeWit: Thank you, Jack, for sharing. Jack Butala: Well, you’ve done it again. Actually, this time, you’ve literally wasted 20 minutes listening to the Jack and Jill show. 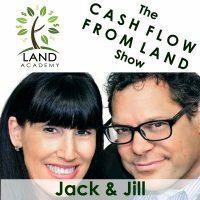 Join us tomorrow where we discuss land versus houses as an investment concept. Jill DeWit: And, we answer your questions. Should you have one, post it on JackJill.com, our online community. Go there, it’s free. Jill DeWit: You are not alone in your real estate investment. Jill DeWit: What are you doing, man? You’re like all over the place today. Jack Butala: I got all jacked up about this topic. Because, you’re a good psychologist. You pull all this emotion out of me. I’m almost crying over here. Jill DeWit: Here, have a Kleenex. It’s okay. Jack Butala: It’s a good thing you and I don’t have any real … we’re not vulnerable people, you know? Jack Butala: Yeah. You gotta put your thick skin suit on. Jill DeWit: No one is ever really ruthless, but believe … boy, if you open up the door, we’re all going to jump in there, and we’re going to do something. You just have to expect it. Jill DeWit: Thank you for sharing today, Jack. That was very nice. If you’d like to share, please share the fun by subscribing on iTunes, or wherever you’re listening. While you’re at it, please rate us there.